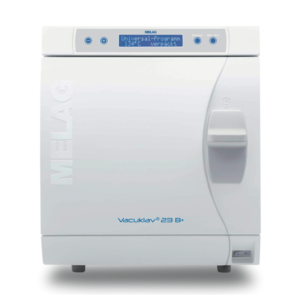 MELAG offers practices an economically alternative to the Vacuklav-series with its Euroklav 23 VS+, which, by reason of the instruments and the type of wrapping used there, require no “Class B” autoclaves. The Euroklav 23 VS+, being larger than the Euroklav 29 VS+, is especially suitable for practices that want to sterilize longer instruments because it has a chamber volume of 22 litres (depth of chamber is 45 cm). 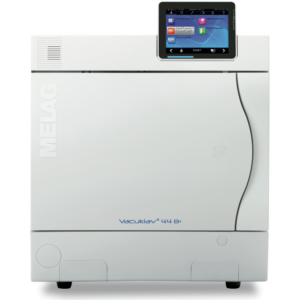 The Euroklav 23 VS+ features four “Class S” programs for sterilization of unwrapped or wrapped instruments and textiles. The powerful and efficient vacuum pump creates a simple pre-vacuum for safe removal of air before sterilization and for optimal post-drying of the instruments after sterilization. 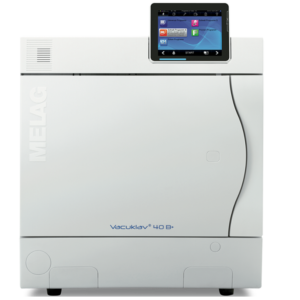 The modern electronic design permits versatility in batch documentation, by integrating with the network and MELAtrace, through the compact flash card or as well as with the known MELAprint 42 log printer.